A federal jury in San Antonio found Democrat Texas State Senator Carlos Uresti guilty on 11 charges of criminal fraud on Thursday. The conviction sent shockwaves through the capital and the senator’s hometown. Senator Uresti and his co-defendant, Gary Cain, stood before a judge in a federal courtroom Thursday morning and listened as the jury found them guilty on all counts. The judge released both men on bond pending a sentencing hearing scheduled for June 25, the San Antonio Express-News reported. The federal wire fraud charges bring the potential of a 20-year prison sentence and a fine of up to $250,000. On each of the charges of money-laundering conspiracy and engaging in monetary transactions related to unlawful activity, the men could receive up to 10 years in prison and an additional $250,000. A federal grand jury indicted Senator Uresti, Mr. Cain, and Four Winds CEO Stanley P. Bates in May 2017, Breitbart Texas reported. A few days later, the senator pleaded not guilty. 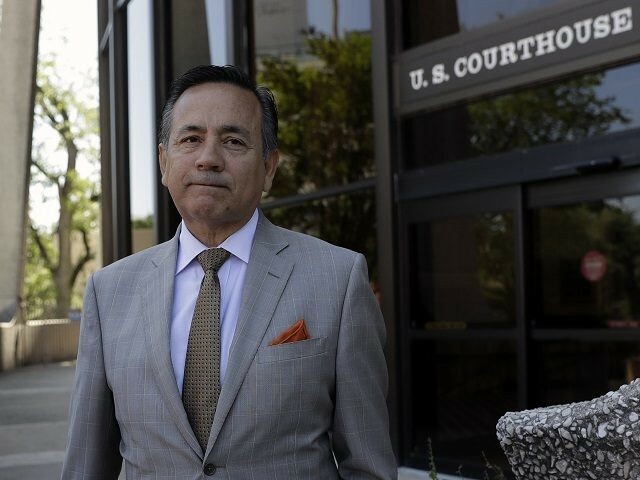 On May 16, a federal grand jury handed down two separate indictments against Uresti with multiple charges in connection with two separate fraud cases. One of the cases dealt with a pyramid-like scheme where prosecutors allege Uresti and co-conspirators used a company called Four Winds to market sand for hydraulic oil production. The businessmen allegedly spent investors’ funds on personal expenses and used new monies from follow-on investors to pay back the older stakeholders. The second indictment alleges that for almost 10 years, Uresti received $10,000 a month to work as a marketing consultant for a company that serviced a Reeves County Detention Center. Uresti has been accused of having paid half of those sums of money as a bribe to a county official to secure future contracts. Information provided to Breitbart Texas by officials within the FBI said the indictments charge that defendants developed a Ponzi scheme that defrauded investors in the hydraulic fracking sand oil production business. The defendants then used funds from newer investors to pay earlier investors and their own personal expenses. Voters in San Antonio re-elected Senator Uresti in 2016. He is not up for re-election until November 2020. He was first elected to serve in the Texas Senate’s District 19 in 2006. Prior to being elected to the Texas Senate, Uresti served as a state representative for House District 118. Texas Lt. Governor Dan Patrick responded to Uresti’s conviction and took immediate action to remove him from Senate committee assignments. Texas Democrats moved quickly to distance themselves from the convicted felon senator. “After being found guilty of such serious crimes, Senator Uresti must seriously consider whether he can serve his constituents,” Texas Democratic Party Communications Director Tariq Thowfeek said, according to a report by the Texas Tribune. Uresti still faces additional charges for bribery and money laundering in a trial that is scheduled for May. He is also the subject of sexual harassment complaints, Breitbart Texas reported in December. The senator said he has no plans to step down and will appeal his conviction. Editor’s Note: This article has been updated with a statement from the office of Texas Lieutenant Governor Dan Patrick and the Texas Democratic Party.